Final push for peace in Somalia? Despite global efforts to combat terrorism in Somalia, al-Shabaab’s attacks continue and the group still controls large parts of the country. 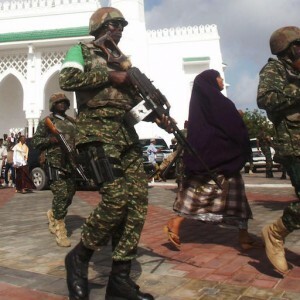 The African Union Mission in Somalia (AMISOM) has been active in Somalia for 10 years, and while it has raised hopes for peace and security, the country is still not safe. The recent election of President Mohamed Abdullahi ‘Farmajo’ Mohamed also inspires optimism – yet again, attacks continue. Famine due to drought and a cholera epidemic add to the hardships faced by the Somali population. Al-Shabaab has taken its gap here. Its publicity campaign to highlight how it is providing food in areas under its jurisdiction – despite having blocked aid in the past – is winning over some of Somalia’s starving people. This is just one example of a government that remains unable to effectively provide services, even as the African Union (AU) plans to exit the country by 2020. Somalia needs more help, and at the London Conference on 11 May, the international community intends to address these issues. Expected to attend are representatives from Somalia and the region, the United Nations (UN), AU, European Union (EU), the League of Arab States and Organisation of Islamic Cooperation, among others. While aid has been forthcoming to Somalia, this hasn’t always happened in a coordinated way. The AU, which has been working closely with the government of Somalia, must play a greater role in this regard – and the new AU Commission chairperson Moussa Faki Mahamat’s trip to Somalia on 18 March was a step in the right direction. The AU’s Peace and Security Council undertook a three-day field mission to Somalia in March to assess the country’s needs, and the UK’s Foreign Secretary Boris Johnson also recently paid a visit to the country. Despite its gains, AMISOM, together with the 20 000-strong Somali National Army, has not been able to vanquish al-Shabaab’s forces. Inadequate military hardware and dependence on international donors have largely constrained the mission from proactive interventions to free regions from the group. Al-Shabaab has between 7 000 and 9 000 forces. The 22 000-strong AMISOM forces are to start pulling out of Somalia in 2018, and the AU is arguing for a final push against al-Shabaab before that date. This is a costly undertaking. Discussions are under way to authorise 4 000 more troops to AMISOM, to help carry out a major offensive to dislodge al-Shabaab from its strongholds in Jubba Valley, the Hiran region and the North East coastline. The troops – from Burundi, Djibouti, Ethiopia and Kenya – are said to be ready, but a lack of funding is delaying their authorisation and deployment. Last year the EU cut its funding for troop allowances by 20%. The London Conference provides an opportunity for international partners to find a more sustainable funding mechanism for AMISOM in their last stretch. Meanwhile, United States President Donald Trump recently relaxed the conditions for airstrikes against terrorists in Somalia. This could boost AMISOM’s campaign, although there have been concerns about collateral damage in US airstrikes in recent years. The question is whether these military actions will create a lasting peace. Al-Shabaab has been known to retake towns and areas after peacekeepers pull out. This casts doubt over AMISOM and the Somali National Army’s capacity to consolidate security gains and ensure the defeat of al-Shabaab in the short to medium term. More likely, there will remain a need for international support to Somalia’s forces beyond 2020 – the year AMISOM’s withdrawal is expected to be complete. The London Conference also needs to address funding for Somali security forces. There are many cases of Somali soldiers defecting to al-Shabaab. Greater international support in this regard could help boost incentives for Somali officers to remain in the army and fight al-Shabaab. However the battle against the terror group cannot be won by military might alone. The conference must tackle the other issues that make Somalians vulnerable to radicalisation and extremism – including the looming famine caused by the drought that has affected over half the population. The AU and the international community must address the humanitarian crisis in order to match al-Shabaab’s efforts to win over the Somali population. This includes food security concerns and the cholera outbreak, and working with the new government to provide services, boost the economy and address corruption and unemployment. The fate of Somali people displaced by violence and hardship is also key to the stabilisation effort. Somalia’s neighbours have witnessed an influx of refugees fleeing violence and humanitarian disasters in recent years. In March the Intergovernmental Authority on Development (IGAD) convened a special summit on protecting refugees and facilitating voluntary returns. This includes accelerating IGAD’s support to security and socio-economic initiatives in the region. IGAD leaders also committed to enhancing the education and training of refugees for ‘self-reliance in the countries of asylum’ and in Somalia when they return. If successfully implemented, this could ensure communities are less vulnerable to radicalisation. At the London Conference, finding solutions to all these challenges will be no mean feat and will depend on collaboration between the international community, the AU and regional structures. The original version of this article can be accessed here.